It’s fall, and on Cape Cod, that often means piles of dead eiders rather than piles of rustling leaves. In the multi-year investigation into why so many common eiders turn up dead around Wellfleet most years, the USDA, USFWS and numerous other groups have partnered up and pooled their skill and resources to try to get to the bottom of what’s happening. Right now, the researchers are wrapping up the live bird sampling phase of this fall’s work; they have been trapping birds as they arrive from their breeding islands–some from as nearby as Boston Harbor, some from nearer the Arctic. The idea is to sample their blood and feces to see if they arrive in Cape Cod Bay already having been exposed to, and possibly even shedding the virus. The birds are also banded so that if they ultimately die (of any cause) and are found, we will know what their viral status was as of the beginning of the overwintering season. The Cape Cod Times has posted an article with some rather delightful photos of this work. Cape Cod is a SEANET hotspot, luckily for us, and many of our dedicated volunteers have offered to help in any way they can. Up to now, biologists were interested in hearing where and when eiders were arriving from the north. 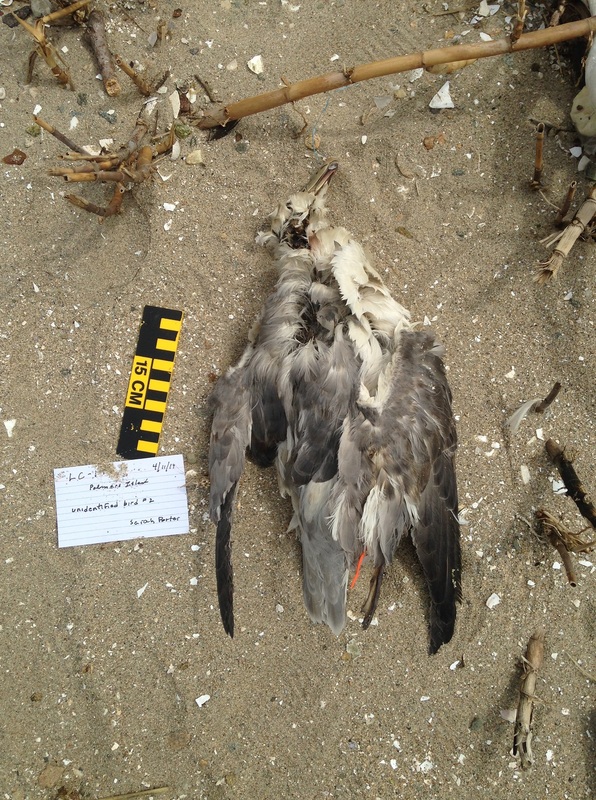 With the sampling work completed, the focus will now shift to documenting and collecting dead birds. 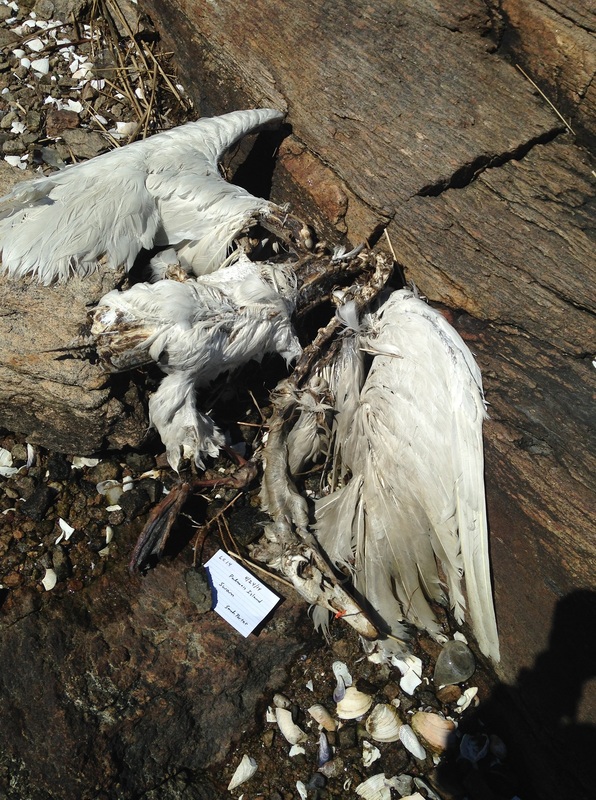 Anyone, Seanetter or not, can help with this effort, so if you see more than a few sick or dead eiders (and this is not just for Cape Cod), please contact Randall Mickley (randall.m.mickley”at”aphis.usda.gov or 413-658-7113). 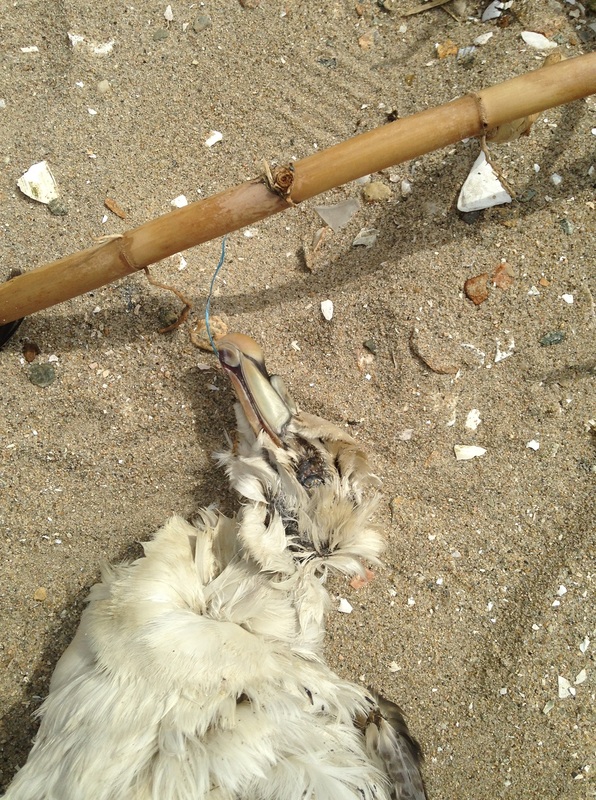 The other critical thing to report is any banded bird found dead. Here is a timely time to reissue our dead bird flyer! Please encourage all your friends and neighbors to jot down any band numbers they find and report them. I can’t emphasize enough how valuable those data are! Before I launch into the DBQ answers, it’s time to revisit an old quiz. Edward wrote in to say that our conclusion on a bird we featured a while back in this DBQ may have been erroneous. He writes that the bird more closely resembles a Brown Booby than the juvenile cormorant we deemed it to be. Edward is right in pointing out that that species is hardly unheard of off the South Carolina coast, so I wanted to bring the debate to your attention and see what you think upon considering this idea. In both cases, after the initial glance that often makes one think of a gull, closer inspection reveals the thick, stocky bill that makes both these birds unmistakably Northern Fulmars. What is interesting is the substantial difference in plumage coloration. Frank’s NOFU is almost white overall, while Sarah’s is a mix of grays and some interspersed brown feathers over the mantle and upper wing. What’s going on there? The answer is twofold. First off, what’s with the light bird and the dark bird? Are they different subspecies? Different sexes? It’s a bit complicated, so let’s start with the basics. 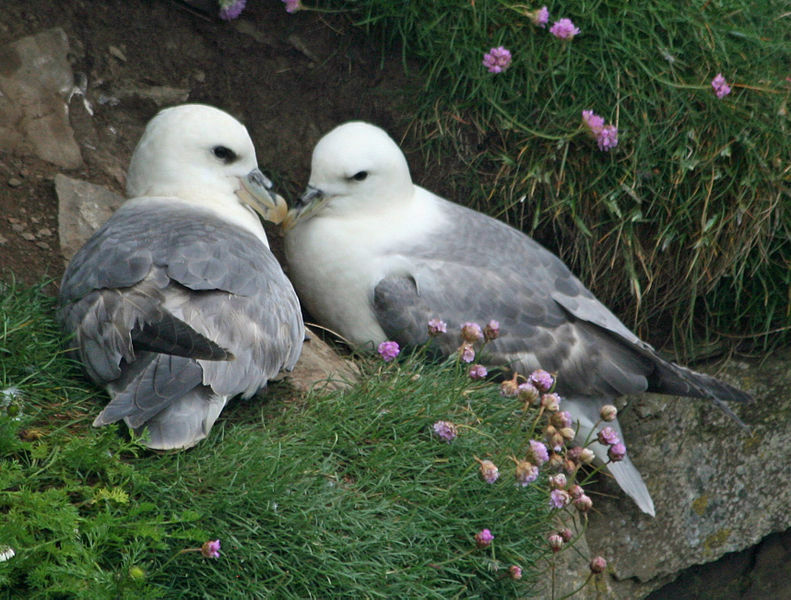 Northern Fulmars are aptly named on both counts. “Fulmar” derives from “foul gull” (and I know many will argue that gulls are foul enough) due to their charming habit of projectile regurgitating stomach oils as a defense. The “northern” refers to their range. The species is circumpolar and nests from the high Arctic down as far south as Newfoundland and France in the Atlantic and the Aleutians in the Pacific. They winter from the limit of the pack ice down to the mid-Atlantic states and sometimes occur as far as Florida or even (very rarely) Mexico. Given this, it is not unusual to have NOFU anywhere along the SEANET territory during the non-breeding season, approximately September through April. After that, they mostly head north to breed, though in some years substantial numbers persist as far south as North Carolina as late as May or June. The species is divided into two subspecies: Pacific (Fulmarus glacialis rodgersii) and Atlantic (P.g. glacialis). Our Atlantic subspecies is larger overall, though within the subspecies, the high Arctic breeders are smaller than birds breeding in boreal regions (farther south). Also within the Atlantic subspecies, there are what we call two “morphs” or color varieties: light and dark. That gets us to the main difference between Sarah’s NOFU and Frank’s. In the Atlantic, the light morph is more common, except for a few pockets in the high Arctic where the dark morph prevails. Even though Sarah and Frank’s birds look rather different in their coloration, both of these would be classified as light morphs since both have all white bellies, breasts and heads. This gives the birds a coloration pattern similar to a Herring Gull overall. Dark morphs are harder to find in the Atlantic, so most pictures of them come from the Pacific where they are more common, but do check out these photos at neseabirds.com to see some very nice comparisons between the two. Finally, that gray/brown mottling on Sarah’s bird. That is evidence of molting going on in this bird, where new feathers are coming in amongst the old. Edward points out that that makes this a bird older than 1 year since it is now replacing those older, worn feathers. First off, the SEANET data entry site is back online! Huzzah! Thank you all for your patience; you should be all set now to enter surveys again. Let’s celebrate with a Dead Bird Quiz. 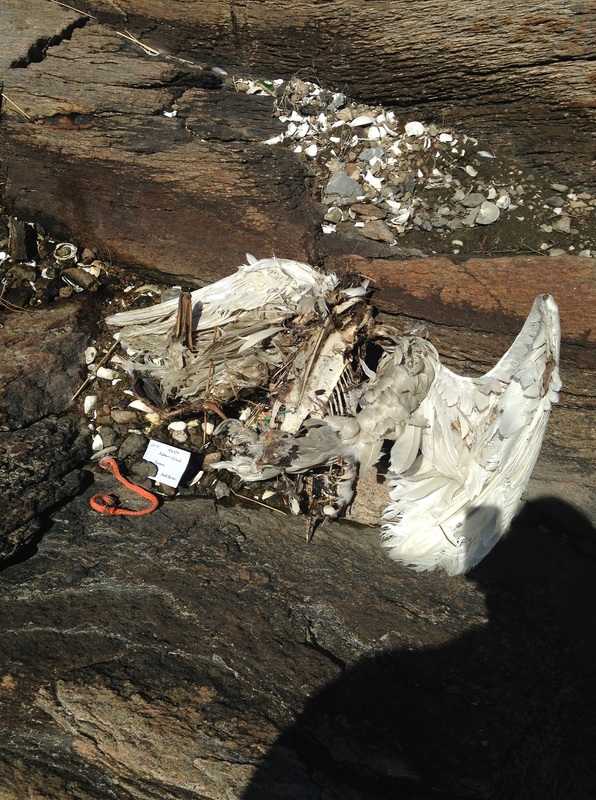 Both these birds were found by volunteer Sarah Porter in April in Massachusetts. What do you think everyone? Data entry portal is down! Many of you have found your attempts to enter your surveys online stymied in the past week or so. I have also noticed this, and it appears that something is amiss with the server that usually dishes up our website. I am trying to track down the problem and have it remedied, but until I do, please be patient and also be assured that it’s not your fault–the error appears to be at the source. To distract you from that though, I have the good news that my basement now hosts 720 copies of the Field Guide to Beached Birds of the Southeastern U.S! Most of these will be distributed to biologists for official use, but we should have enough to get out to any interested Seanetters too. More details to follow! Arctic seabirds sound their warning; who’s listening? This past weekend, New Hampshire Public Radio, my preferred news venue, wrapped up their fall fund drive. I listen even during the drive, possibly out of a self-flagellating penance for not actually donating. There’s something satisying about the guilt. During the fund drive, the announcers were pushing their drawing for a free trip to Costa Rica. “Unbelievable! The biodiversity is higher than anyplace else on Earth!” You’ll get no argument from me on the merits of a Costa Rican getaway, nor on the diversity of species to be found there. But for certain species groups, the highest biodiversity comes not down near the tropics, but near the poles. I’ve just been reading a report on Arctic seabirds from the Conservation of Arctic Flora and Fauna (CAFF) group. In it, the authors point out that the cold (though ever warming) waters of the northern oceans have historically been a nutrient bonanza on which these birds can rear their young. Now though, the convergence of the mutliple evils we’ve managed to work on our oceans appear to affecting many of these species quite profoundly. 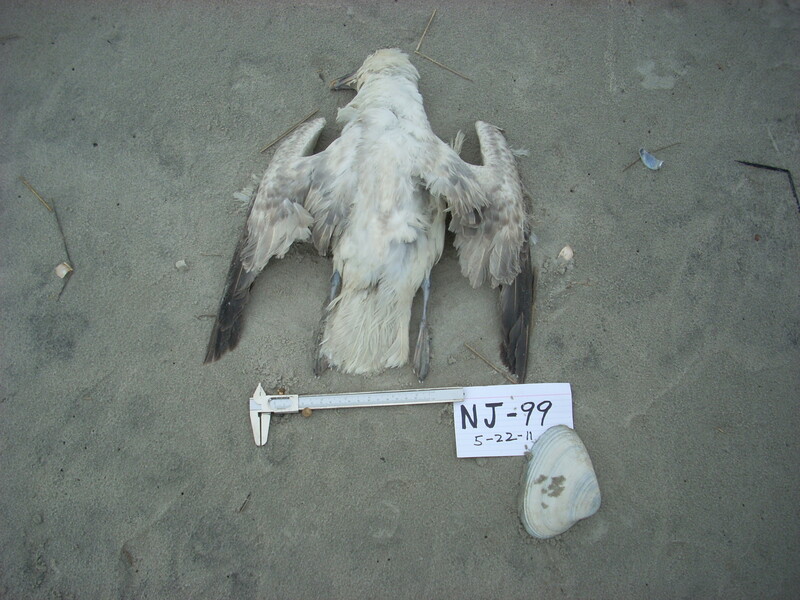 Seabird populations are challenging to study and count. Aside from the breeding season when they come onto land, many of these long distance seafarers lead a nomadic existence and pinning down their numbers is difficult. For some species, we don’t have reliable census data even for the breeding colonies, or, if we do, only for the past few decades or so. These limitations make it hard to pick up on anything but catastrophic population crashes. What researchers are finding now, is a disconcerting emptiness on many of the colonies. In Iceland, historically a hotbed for seabird breeding, scientists now find empty puffin burrows, eggs or dead chicks rotting in abandoned tern nests, and entire swathes of islands devoid of much bird life at all for several years running. Seabirds tend to long lives, and one or two bad breeding seasons are easily borne. But as more and more years like this pass, where the adults either return to the colony and fail to rear any chicks, or simply don’t attempt to breed at all, the consequences for the future grow more grim. These adults will continue to age and will ultimately die, even if they live 30 or 40 years before that happens. If there have been no young birds coming up to take their places, the results are clear. What still isn’t clear is why these breeding collapses are occurring. The CAFF report points to changes in sea ice, altered prey distributions, and increasing frequency of extreme weather events as possible players. A 100 year storm, after all, can wipe out many adults in a breeding population. When those 100 year storms are coming every four or five years…a population only has so much resilience. We do know that seabirds will respond to prey availability changes by altering their foraging behavior. This graph depicts the type of prey brought back to the nest by thick-billed murres. Looking at the blue and yellow sections of each bar, we see the shift beginning in the 1990’s from the ice-associated polar cod to capelin as ice breakup came earlier and earlier in the season. Whether or not an alternative prey is equally appropriate for rearing nestlings varies with the prey. Such shifts seem to coincide with decreases in chick survival in some species, so it does appear that one fish is not necessarily as good as another. Pollutants in the foraging waters and in the prey are still an issue, with mercury levels in some seabirds high enough to affect breeding success, and persistent organic compounds like flame retardants and pesticides in eggs at concentrations high enough to make them unfit for human harvest and consumption. Some researchers even point out that warming oceans boost the metabolisms of the fish swimming in them, which could make them able to swim just a bit faster and evade their avian pursuers. For birds already on the thinnest of margins of survival, even an effect so slight would be piling on their troubles. One thing is perfectly clear in reading through all these reports and into the research itself; while empty-headed commentators on the pretend news try to drum up paranoia and conspiracy theories about the existence of climate change, the scientists are keeping their heads down, scanning for the few eggs or chicks still viable, certain in the knowledge that climate change is wreaking havoc already, and we may be watching these birds disappear. The salt glands are organs you may have seen in action in living birds like gulls, which will occasionally tilt their beaks down as a clear liquid runs down from their nares. These are secretions from the glands, which function almost like an accessory set of kidneys, cleaning salts from the blood and allowing seabirds to drink saltwater and compensate for their actual kidneys’ comparative (to mammals) lack of ability to produce concentrated wastes. 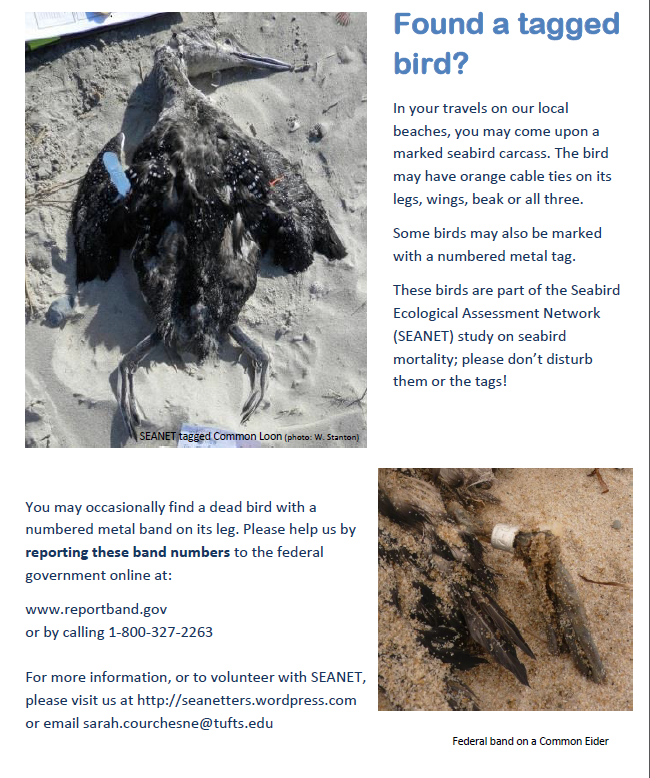 The second item for your persual today is a flyer I worked up to address the many questions that nature centers, town officials, and biologists get from the public about birds sporting metal tags or orange cable ties. If you walk a beach for us, and know of an information board, a nature center, community center, public library or other spot where people might see one of these, would you consider printing and posting one for us? We might gain some new recruits, or, at the very least, alleviate some confusion among beach goers not in the know.